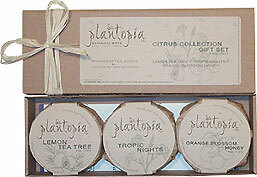 Each time you purchase 3 of our bars of soap or one of our 3 bar gift boxes, Plantopia will make a donation to plant one tree and you will receive a certificate confirming Plantopia's donation. Click here for details. Plantopia, Inc. is proud to contribute to the Tress Across America Campaign and is committed to planting one tree every time three bars of their soap are sold. This campaign is sponsored and supported by Earth Day Network and American Forests' Global ReLeaf Program. 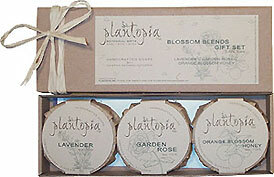 Each time you purchase 3 of our bars of soap or one of our 3 bar gift boxes, Plantopia will make a donation to plant one tree and you will receive a certificate confirming Plantopia's donation. As we grow and add new products you will find that many of them contribute to our "Buy Three, Plant A Tree" program. Thank you for helping us to support the efforts of Earth Day Network and American Forests. For more information on the Trees Across America Campaign, please click on the Earth Day Network logo on our home page. 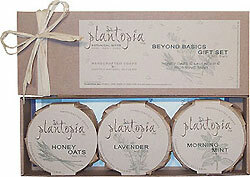 Plantopia's soaps are handmade from scratch using a cold process method. We select only the finest vegetable oils, pure essential oils, natural additives, herbs and herbal teas for our ingredients and we choose not to use artificial colorants, fragrances or preservatives. Our base oils are a combination of olive, coconut, palm, jojoba, avocado, shea butter and palma christi oils. To create our soaps, these oils are combined with an alkali solution of distilled water or herbal tea and sodium hydroxide. The resulting chemical reaction is known as saponification. When the process of saponification is complete, the oils and alkali solution have been converted to create a pure and natural soap that contains glycerin. In addition, we carefully calculate our formulas to ensure that additional oils will remain in each bar of soap. We believe that these extra or unsaponified oils result in creating a milder and more luxurious soap that is less drying to the skin. Our sea soaps are specially formulated to lather in salt water and were created with our seafaring customers in mind. We often hear from our customers how great it is to be able to wash up while out at sea. Our sea soaps are also made using the cold process method and follow the same guidelines as our other soaps. The recipe for our sea soaps was formulated after extensive research and is primarily comprised of coconut oil with the addition of a few other secret vegetable oils that add to its lathering capabilities. Since all of our soaps are handmade and cut by hand you may notice small variations in appearance. It is our belief that these small variations add to the character of our soaps and are proof that they are indeed handmade, from scratch. All of our bars are round and approximately 3 inches across. Each bar weighs 4oz or slightly more. We take great care in selecting the ingredients for our soaps and list them proudly on our packaging. We suggest that all customers should perform a "patch" test, as you would with any and all soaps or skin care products, prior to using. We do not recommend our scented soaps for infants or small children. If you have any questions about our soaps, please do not hesitate to contact us. If irritation or allergy occurs, discontinue use.